Plastic bags are made out of “film”, or thin flexible sheets of plastic. Plastic film is typically defined as any plastic less than 10 mil thick. 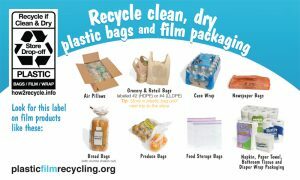 The majority of plastic films are made from polyethylene resin and are readily recyclable if the material is clean and dry. The resin coding system was originally intended for rigid plastic containers only. However, many manufacturers put the code on plastic films too. If no resin code is printed on the plastic film or bag, the film’s application may indicate the resin type since different resins are chosen for their unique performance or observe the film’s characteristics and appearance and compare to the descriptions below.